Wanna combine fun with fitness for your kids? Give them a mini trampoline. Jumping and tumbling will help your child develop spatial responsiveness as well as improve balance, motor and cognitive skills. It will also give your children a break, away from modern electronics. Bouncing is a healthy and fun exercise for kids of all ages. Jumping on a trampoline is a safe and effective workout that gives children the essential aerobic exercise even if they remain indoors. Trampoline exercise helps adults as well as kids to stay fit, develop motor skills, increase stamina and improve balance, flexibility and coordination. 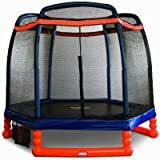 5 Are indoor trampolines safe for small kids and toddlers? 6 How can you improve the safety of kid’s trampolines? 7 How can trampolines help a child’s development? Little Tikes is a well-known name for high quality toys. 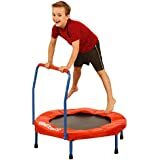 The Little Tikes 3 foot round trampoline is another great product to keep your kids active anytime anywhere. This kid’s mini exercise trampoline is easy to assemble, safe and compact. This trampoline is designed for indoor use and has a maximum weight limit of 55 pounds. Multiple kids should not be allowed to jump together. This product needs to be assembled for it to be operational. The screws, rubber caps, padding, wrench, screwdriver, instruction booklet, etc. are included in the package. Assembly may take 30 minutes to an hour. Suitable for kids from three to six years. The padded handle bar is not foldable. However, it can be unscrewed. The legs cannot be folded flat but can be removed for storage. This mini trampoline weighs around 15 pounds and can be easily moved around. Can be placed on the carpet for greater stability. The legs are rubber capped but users have reported that it tends to slip on hardwood floors. This trampoline does not have metal springs. Instead, it has flexible elastic bands that are much safer and durable. The balance handle bar is positioned more towards the center of the trampoline rather than at its edge. This is safer and prevents the trampoline from tipping over when children lean on to the bar. The trampoline is fully functional without the balance bar. Many users have reported concerns about the handle bar being slightly wobbly. The highest point of the handle bar from the jump mat is around 28 inches. Therefore, before purchasing ensure that your child has the required height to grip the handle bar properly. The handle bar is fixed in place and cannot be adjusted. The trampoline has five legs in total that are about eight inches high. The jumping area is around 26 inches. 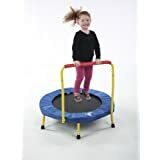 One of the great aspects of the Fold and Go trampoline is that it has slanted rubber caps on all the legs so that it stays steady on the ground and doesn’t rock around. This trampoline is extremely easy to setup and will just take a few minutes to assemble. This trampoline is recommended for children aged 3 to 7 years. The Fold & Go trampoline has six legs in total. The handle bar is around 24 inches from the jumping mat. You may tape the handle padding to prevent kids from biting into it. Weight limit for this mini trampoline is 150 pounds. Multiple children should not get on the trampoline at the same time even if it is within the weight limit as it may increase the risk of injury. This trampoline has safe elastic straps instead of metal springs or bungee cords. Therefore, it has a good silent bounce. The trampoline is very durable and elasticity is not lost even after months of usage. Can be assembled in minutes with minimal tools. Disassembly is easy as well and it should be stored flat without folding. Since the handle bar is located on the side, kids should not hang or swing on it as the trampoline may tip over. A user has suggested that a five-pound weight may be attached on the rear leg, which could reduce the risk of the trampoline tipping over. The trampoline should not be used without the handle bar as kids can lose control of their jumps. The jumping surface is about 25 inches wide and total width is 30 inches. The rubber caps prevent scratches but may leave black marks on the floor if the trampoline is pulled across. The trampoline is meant for indoor use only. The unit weighs just 17 pounds. 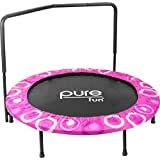 With a massive 48-inch diameter and adjustable padded handle for extra stability, the Pure Fun Super Jumper rebounder provides sufficient extra space for kids and toddlers to jump and have fun. The handle bar is easily removable. Just press the metallic buttons and pull it out. This is a trampoline with 42 galvanized metal springs for extra bounce. The benefit of springs over bungee cords is that they will last longer whereas bungee cords are prone to wear and tear. The springs also give a lot more bounce than elastic bands. The springs are well protected with a vinyl skirt and are located under the jumping mesh. The jumping surface is around 36 inches. The total width of this trampoline is 48 inches. Users have reported that this trampoline might tip over if the heavy kids swing on the handle bar. The assembly is a little more complex due to the metal springs. Complete setup may take 30 minutes to one hour. The weight limit is 100 pounds but users have suggested that it should not be more than 60 pounds, as springs are likely to break beyond this. Users have used this trampoline both indoors and outdoors. This trampoline is recommended for kids and toddlers aged between 3 to 10 years. This trampoline is not foldable and has six legs. The unit weighs around 15 pounds. 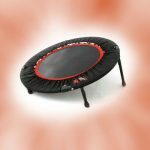 The Kangaroo 36 inch trampoline is very easy to setup and can be used indoors as well as outdoors. It’s a great exercise tool and can even support older kids with a 150 pound weight limit. This trampoline has sturdy elastic bands instead of springs. You would need to unscrew the handle bar to remove it. It does not fold; therefore, you will need to disassemble for storage. Users have reported that the elastic bands are stiff and the bounce is soft. The handle bar is located towards the side of the trampoline. Therefore, bouncing too high while holding / pushing the handle bar can cause the trampoline to pop forward. This is a major design flaw for most of the trampolines except the Little Tikes 3 foot trampoline where the bar is more towards the center. The assembly is easy with minimal parts and takes around 15 minutes. Easy to follow visual instructions are provided. The trampoline in the box is folded in half and you need quite a bit of strength to push it apart. Once the two sides snap into place, next steps are a breeze. The protective cover on the edges prevents kid’s feet from falling into the elastic straps. The recommended age limit is 5 years and above. 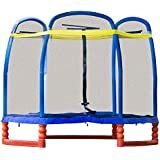 This indoor / outdoor mini kid’s trampoline has a safety net enclosure to prevent kids from falling out. It takes up very little indoor space and can be setup in a medium sized playroom, bedroom or basement. Can be used indoors or outdoors all year round. Weight limit is 100 pounds. The trampoline does not have a cover. Many people have used a tarp / camping canopy to cover this trampoline outside to protect it from rain or sun. The trampoline is about 7 feet tall and 7 feet wide. The poles are metallic and are covered with dense foam. It took users around one to two hours to assemble this unit. This trampoline is recommended for kids aged 3 to 10 years. The jumping area is about 5 feet and the legs cannot be adjusted. This trampoline has metal springs, which are covered with UV protected foam pads. The SkyBound Kid’s trampoline provides ample hexagonal space for your kids to jump around and have fun! You may install it in your backyard and during extreme winters move it indoors. 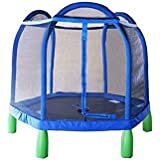 Users have suggested that this trampoline be installed where the ceiling height is at least 9 to 10 feet so that kids don’t hit the ceiling while bouncing. The trampoline is around 7 foot high from the ground. The weight limit is 110 pounds but this trampoline has been stress tested up to 220 pounds. Recommended age is 2 to 8 years. Net enclosure with zipper ensures safety. The jumping area is around 60 inches. The metal springs are zinc plated and are fully covered with padding. Ensure to install springs evenly and diametrically opposite to each other to prevent buckling during assembly. The trampoline mat is about 18 to 24 inches from the ground. Assembly takes anywhere from 30 minutes to one hour. It may not be easy to assemble / disassemble frequently. You may need another person to help you to hold the surface while you tighten. The metal poles and legs are completely padded for safety. This trampoline is likely to shift its position on a hard surface. Therefore, you may place non-slip mats underneath. The unit weighs around 73 pounds and is light enough to move around easily. The disadvantage is that it may fly off during stormy weather! 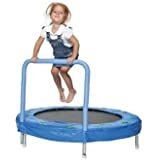 Use movement and bouncy fun to encourage your child to stay active with Skywalker Seaside Adventure Bouncer mini trampoline. 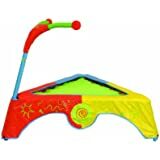 This small rebounder features a safety enclosure with a 360 degree hand rail to provide your child and extra layer of safety and support. Extra safety with a gap-free trampoline design. 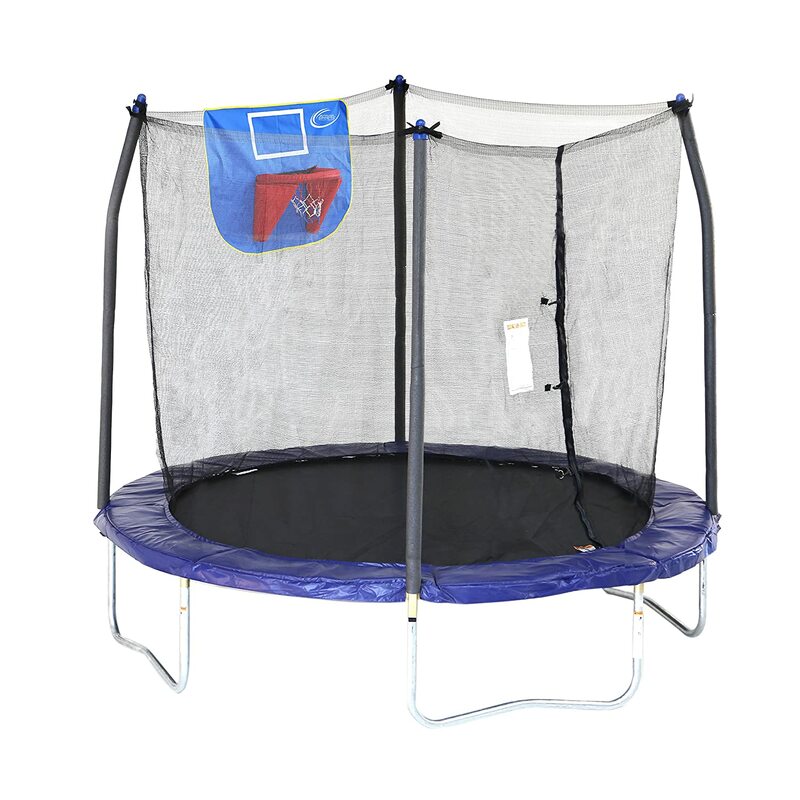 This mini trampoline is suitable for ages 3 to 7 years and has a 100-pound weight limit for a single user. The trampoline is not suitable for outdoor use or outdoor storage. You may place it in a large playroom or a garage. Ensure you place the trampoline on a level surface to avoid tipping. The jumping surface is around 50 inches. Some customers found the assembly instructions very vague and not clearly explained. It may take two hours to assemble. Straightening the last few legs was difficult for a few users but once straight, it was level and balanced. Only one child should be allowed to play on this trampoline at a time. Having multiple kids on a mini trampoline may increase the risk of injury. 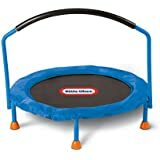 This mini trampoline is extremely lightweight (weighs less than 25 pounds) and is easy to move around. However, it may be difficult to pass through a standard doorframe due to its size. The jump surface is around 10 inches above the ground. Therefore, a ladder will not be required. Kids can simply crawl in. This trampoline does not use metal springs to prevent pinching. Instead, it uses well-concealed elastic bands for a safe and silent bounce experience. The poles and handrail is foam padded for protection. It has six legs and is not foldable. Therefore, assemble it in a room where you intend to use it as it may not pass a standard doorway. The height of the assembled trampoline measures around 5 feet. The enclosure door has a double zip (outside and inside). Trampolines are available in varied shapes and sizes. 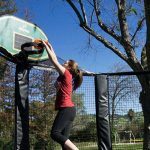 Before we list the different types of kid’s trampolines, let us talk about indoor and outdoor trampolines. Outdoor Trampolines are the most popular type of trampoline out there. If your house has a large backyard, an outdoor trampoline would be the right choice for you. Indoor Trampolines are ideal for use inside the house. Compared to outdoor trampolines, indoor trampolines are smaller and easily foldable. Therefore, once your kid has finished playing on it, you can fold up the trampoline and place it aside to make more room. Round trampolines are the most commonly available outdoor trampolines for kids. You can find them in different sizes – ranging from 12 to 18 feet. They are lightweight and affordable, making it ideal for recreational use at home. In contrast, rectangular trampolines are a type of outdoor trampolines, usually used by gymnasts for training sessions. Bounce houses (or closed inflatable trampolines) are another variation of outdoor trampolines available in the market. 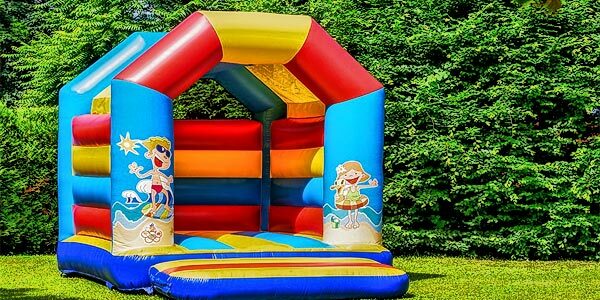 These are inflatable structures available in a wide range of shapes – castles, buildings, animals, etc. You will find Bounce houses in amusement parks, fairs, and carnivals. You can also rent them for a kid’s birthday party or a function. Mini trampolines or rebounders are indoor or outdoor trampolines, which you can place inside your kid’s bedroom, playroom or lawn. 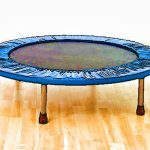 An indoor mini trampoline is a popular choice among parents because it allows them to supervise their children while they are carrying out their household chores. These trampolines are small and can easily fit inside your kid’s playroom or bedroom. If you do not have enough room in your house or your backyard, you can opt for another option – trampoline parks. 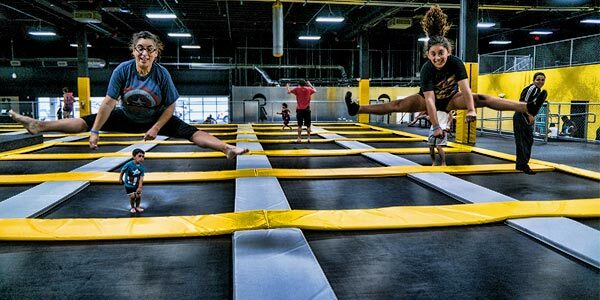 Trampoline parks have soared in popularity in the recent years. These parks provide different types of trampolines, which are suitable for young children. This is a great way to let your kids experience some bouncy fun without burning a hole in your pocket. Are indoor trampolines safe for small kids and toddlers? While bouncing on a trampoline can be a fun activity for youngsters, trampoline safety is a major concern among parents. A study done by the American Academy of Orthopedic Surgeons strongly discourages the use of trampolines among young kids, especially those below the age of six years. Data gathered by the Consumer Product Safety Commission from hospitals in 2017 estimated the number of trampoline related injuries sustained by kids below the age of eighteen as 145,207. 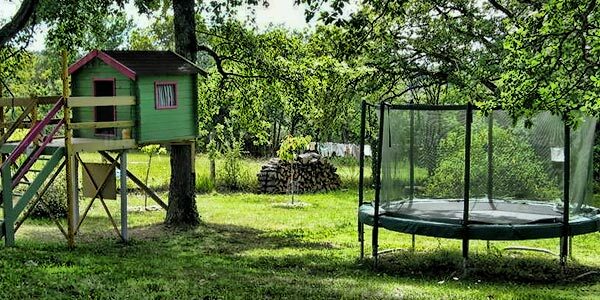 Despite the disturbing stats, indoor trampolines with safety enclosures and framing pads are generally considered safer in comparison to their outdoor counterparts. In an outdoor trampoline, kids can fall onto the ground and sustain serious injuries and you can avoid this by using indoor trampolines. How can you improve the safety of kid’s trampolines? Mini trampolines are safer than its other variations, and suitable for use by kids. A study conducted by experts from Center for Injury Research and Policy analyzed data gathered by National Electronic Injury Surveillance System (NEISS) to compare the number of injuries caused by mini trampolines and full-sized trampolines in the USA from 1990 to 2002. The study revealed that mini trampolines were responsible for very few injuries and most of them did not require hospital admissions. Despite the minimal safety risk associated with mini trampolines, the report advocates certain precautions by parents. Maintain the age limit: Every trampoline comes with a specific age limit provided by the manufacturer. It is important that parents check the age limit mentioned on the trampoline to ensure that their kids fall in the stated age category. One jumper at a time: More than one jumper on a trampoline is the main cause of trampoline-related accidents. 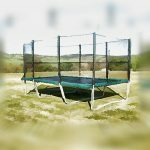 Install an enclosure net: Mounting a safety enclosure can go a long way in minimizing trampoline related injuries. No flips or somersaults: Performing flips and somersaults on the trampoline is one of the leading causes of trampoline related injuries. While it is important that kids have fun, you should not allow them to do flips or somersaults. Adult supervision is necessary: The American Academy of Pediatrics recommends constant adult supervision when a kid is on a trampoline. How can trampolines help a child’s development? Cardiovascular activity: A report released by Canadian researchers in 2017 stated that toddlers aged between 1 to 4 years require three hours of physical activity on a daily basis. It states that physical activity should include one hour of ‘energetic play’ for toddlers aged between 3 and 4 years old. The report based these guidelines on various research studies, which reveal that kids these days spend too much time on electronic devices, and tend to be less physically active than their parents were when they were of the same age. This is a disturbing trend because lack of exercise can lead to childhood obesity and other diseases. Nevertheless, this problem can be easily counteracted with the use of trampolines. 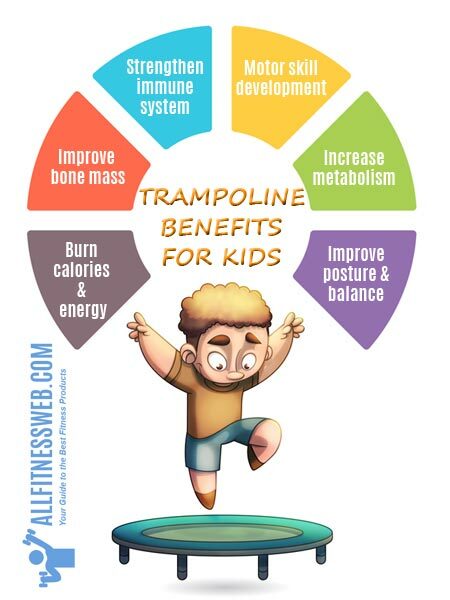 Bouncing on a trampoline is not just a fun activity for toddlers; it also provides a great cardiovascular workout. Muscle toning and flexibility: Trampolining strengthens and lengthens various muscles in the body, thereby improving flexibility and posture. Improves motor skills and coordination: The up and down movement on a trampoline teach toddlers to respond to the constantly changing gravitational shifts. They learn to use both sides of their brains and the body at the same time. This process helps them in acquiring new motor skills and improving coordination. Stimulates the vestibular system: The vestibular system is a sensory system, which is centered near the cochlea and forms a part of the labyrinth of the inner ear. It provides sensory information relating to equilibrium and spatial orientation. It acts as a unifying system, which helps in coordinating the information received from other sense organs. Thus, the vestibular system helps us in performing almost all the daily tasks. It plays a crucial role in a child’s development and trampolining can help in stimulating and developing the vestibular system. Increases self-esteem: Mastering a new skill helps toddlers gain more confidence, which in turn increases their self-esteem. Bouncing on a trampoline is an exhilarating experience and a beneficial activity for the overall development of young children. However, purchasing a trampoline for your little ones can be a difficult decision to make, as there are several options available in the market. It is very essential to buy the right trampoline to reduce the risks of injuries. Here are a few factors, which you must consider while purchasing a mini trampoline for your toddler. Type, size and shape: Mini trampolines are available for both outdoor and indoor use. There is not much variation in terms of shape or size; it tends to depends on the materials used by the manufacturer. 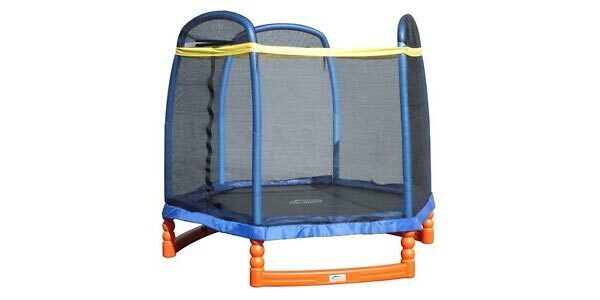 Mini trampolines ranging from 4-8 feet are ideal for use by toddlers. Round shaped mini trampolines are ideal for recreational use. 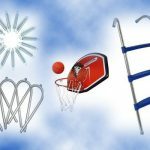 Age limit and weight capacity: Age and the weight of the user are important considerations while purchasing a mini trampoline. When purchasing a mini trampoline, you will find that each model comes with a specific age limit and weight capacity mentioned by the manufacturers. Check those specifications and ensure that your toddler falls within the recommended age group and the weight limit. 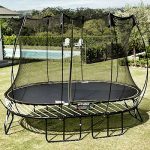 Safety features: Make sure that the mini trampoline you buy comes fitted with basic safety features such as a safety net, pads framing the springs and ground anchors. Ease of assembly: If you plan on setting up the mini trampoline on your own, you should consider the ease of assembly and read the user manual carefully. However, for safety purposes, it is always better to ask an expert for help during installation. Durability: Look for trampolines advertised as ‘heavy duty’. A durable trampoline can avert the risk of injuries largely. Heavy-duty trampolines are strong and provide maximum stability. They can also support multiple jumpers. It makes sense to buy one that provides the best safety features and lasts longer. In addition, you should read the customer feedback of a particular product and do your own research before making a purchase decision. 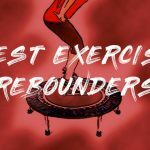 Is Bouncing On A Mini Trampoline A Good Workout?